Before the JD: Undergraduate Views on Law School is the first of two AALS reports based on the BJD study. 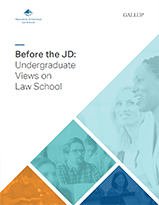 This report focuses specifically on law school enrollment and the JD—what undergraduates think about it and what factors into their consideration, and what drives the decisions made by first-year law students regarding their enrollment. Highlights from the report, including findings about when and why students consider a JD and how they learn about law school, are available for free download. Full copies of Before the JD: Undergraduate Views on Law School are available–order your copy now. To pay by check, please submit this form (PDF) by mail.